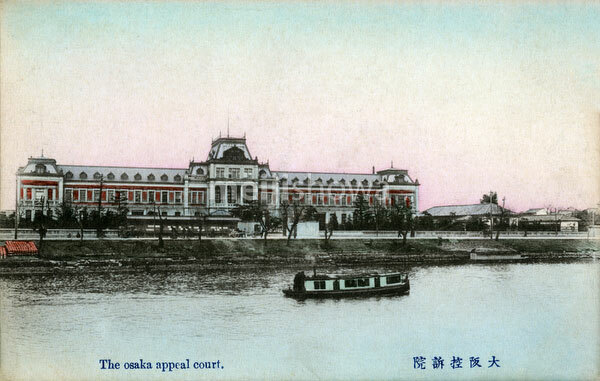 A boat passes by the Osaka Court of Appeal (大阪控訴院) on the bank of the Dojima River in Osaka. This three-story brick building was the third building for the Osaka Court of Appeal. It was used from 1900 (Meiji 33) through July 31, 1909 (Meiji 42) when it was destroyed in the Kita Taika (北の大火, Great Kita Fire), also known as Tenma Yake (天満焼け).